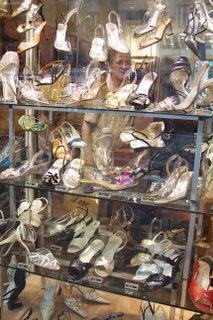 Last fall, I complained a bit about the true price of "choo-chee" shoes. Vowing never to get blisters again, I tucked my sandals away and stuck to tennis shoes for months. This was pretty easy in the dead of winter, but spring just begs for sandals and open-toed shoes! So, I broke my vow ... and I'm sitting here with blisters on my feet again. I don't blame myself, however. I blame the Parisian women. Here's why. First, just look at the picture of my nearest shoe store window! Have you ever seen so many strappy heels in your life?? Well, every single shoe store in the entire city is loaded full of them. Sparkly silver. Metallic gold. Black leather. White satin finish. Clear with fake flowers. You name it, and there is a strappy heel in Paris to meet your needs. What's worse is that every woman in Paris is wearing a pair of these shoes. OK, there are a few pairs of tennis shoes running around town, but they, too, are very stylish and trendy. In fact, I've never seen so many bright red tennis shoes in my life, either. When faced with these options, I have to either follow the strappy trend or stand out in my white tennis shoes. I never thought I would have to choose between foot health and fashion! Up until yesterday, however, I just assumed that the Parisian women had just grown accustomed to tight, pointy, spiked-heel shoes. After all, I never see a woman walking around with a pained look on her face. But yesterday, I went to the Foire de Paris with Isabelle, who was wearing a pair of very stylish black heeled boots for the occasion. (Bear in mind that the Foire de Paris is more or less like a GIANT home and garden show.) By the end of our five-hour exploration, Isabelle was just about ready to collapse because her feet hurt so bad. Heck, even in my flat everyday sandals, I was working up a decent blister! I can only imagine how bad it was for her. And yet, this is exactly why I blame the Parisian women for my predicament. They collectively made the decision to value fashion over foot health, and they act like they have both! Not fair! All I wanted was to fit in ... but is the dark side of the fashion club worth it? I guess some days it is, but at the moment, I'll take my tennies. have you ever seen so many orthopedics stores as in europe? that's why i, too, stay away from the wedge heel. so great to read your entry and hear your 'voice'. and love the photo of the window display with scattered shoes!